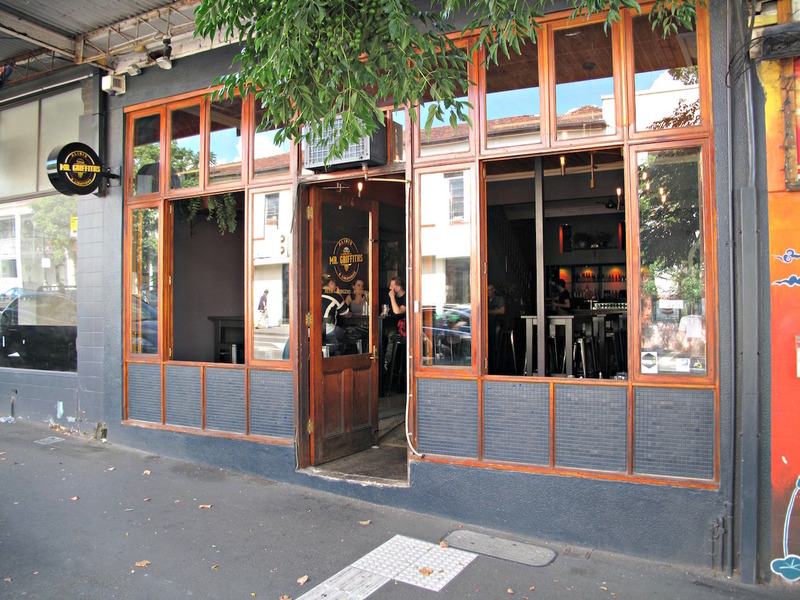 Melba Social lives in the premises formerly occupied by Mr Griffiths Alibis & Libations, which closed some time ago. We don’t know what happened there – its beer, burgers and poutine routine seemed to be going pretty well judging by the people bustle we observed there on numerous occasions. 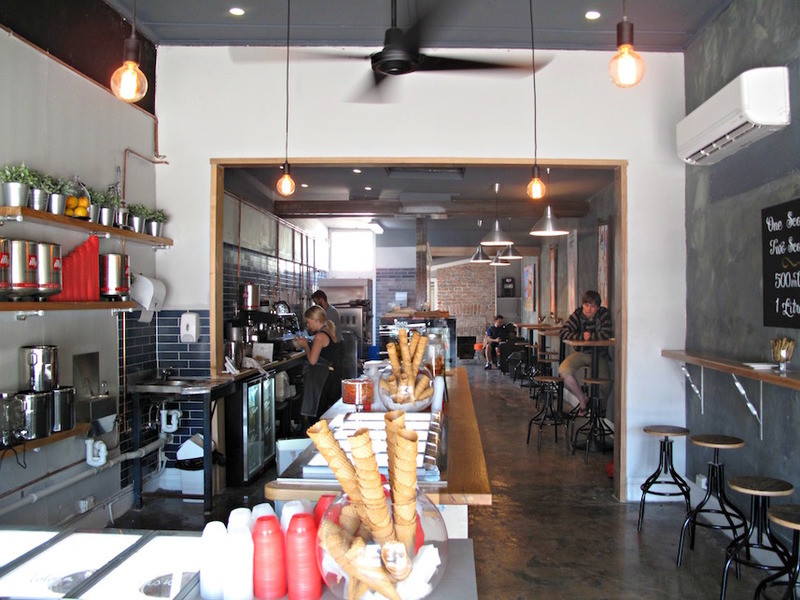 Melba Social is up and running just as two other new/newish places – Kensington Food Hall and the revamped Hardimans Hotel – are offering similar offerings, all three joints within a few street numbers of each other. 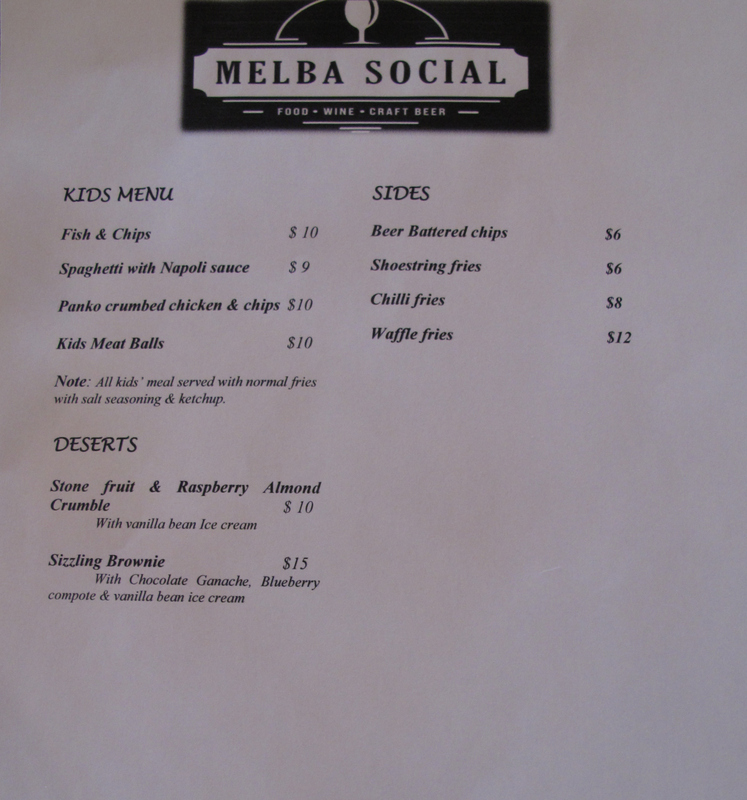 Of course, we are interested to see what Melba Social tastes like so are happy to accept an invitation taken up by a CTS Team of three (see full disclosure below). 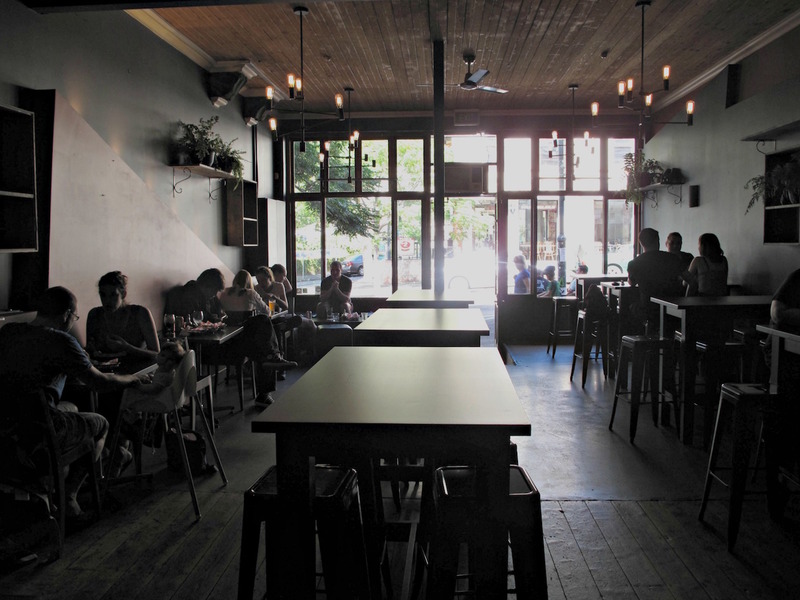 We find the food and service to be lovely, with much of the latter crossing over to very good. It is mostly straight-up Italian fare here. Notably, the portion sizes and pricing both serve to generate an impression of good value, that impression given heft by the busy Thursday night of which we are part. A trio of arincini ($13) – plump, generous and gooey with mozzarella and mushroom, topped by parmesan and rocket, all residing upon a superb, basilised tomato sugo. “Freaking hot” buffalo wings ($15) are only mildly spicy and look rather drab. But the proof is in the eating – they taste very fine and the serve is plenty big enough for all of us to have a hearty go. 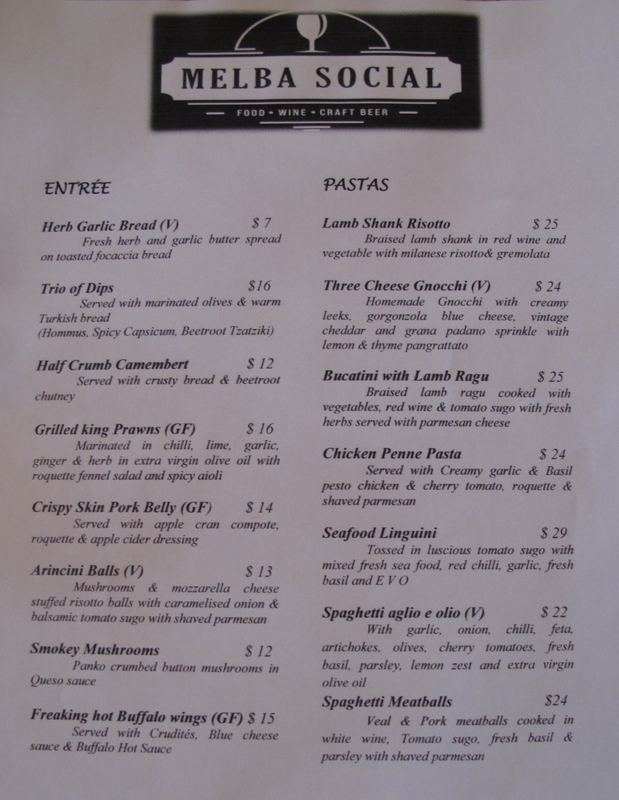 Oddly enough, it is the entree with the plainest visuals – “smokey” mushrooms ($12, above) – that most impresses. 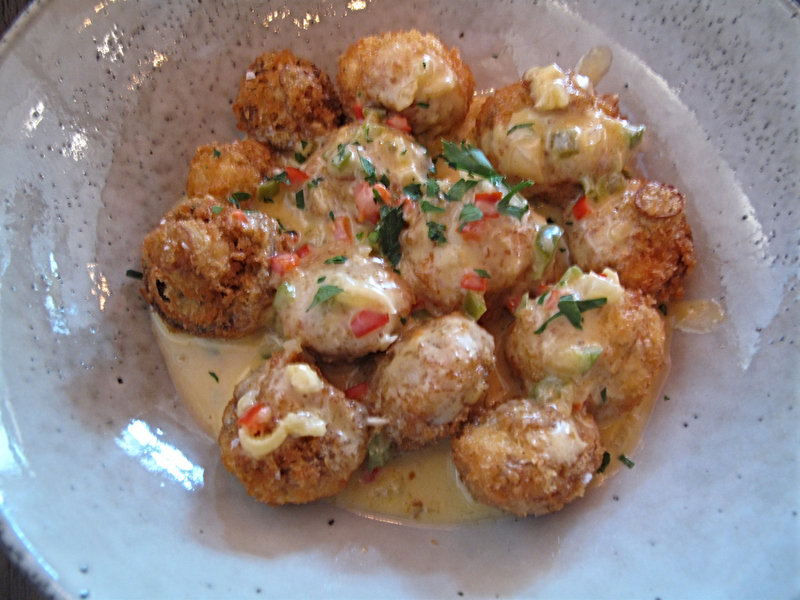 The panko-crumbed mushies are quite delicate and so, so juicy and tasty. The queso sauce is very rich. 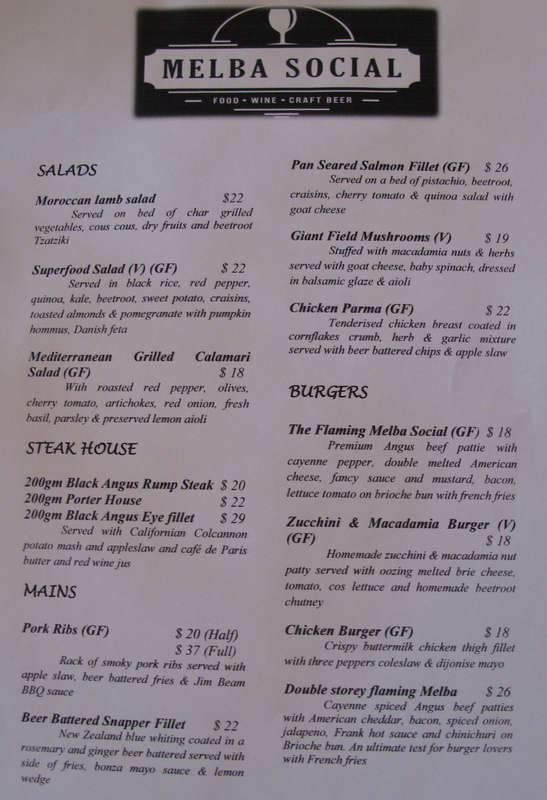 Thursday night is steak night at Melba Social, though one of the three costs exactly that anyway. Whatever – my 200-gram porterhouse ($22) is top stuff, delivered just right at medium rare. I’m normally no fan of mashed spuds that render the lead vegetable into a rich puree with only the faintest tuber vibe. But here the mash goes not that far and is a fine steak friend. The “cafe de Paris” butter is somewhat excess to my richness requirements. The coleslaw is finely chopped and a little wilted – that is, just how I like it. But I find myself wanting more acid or bite. Or salt. 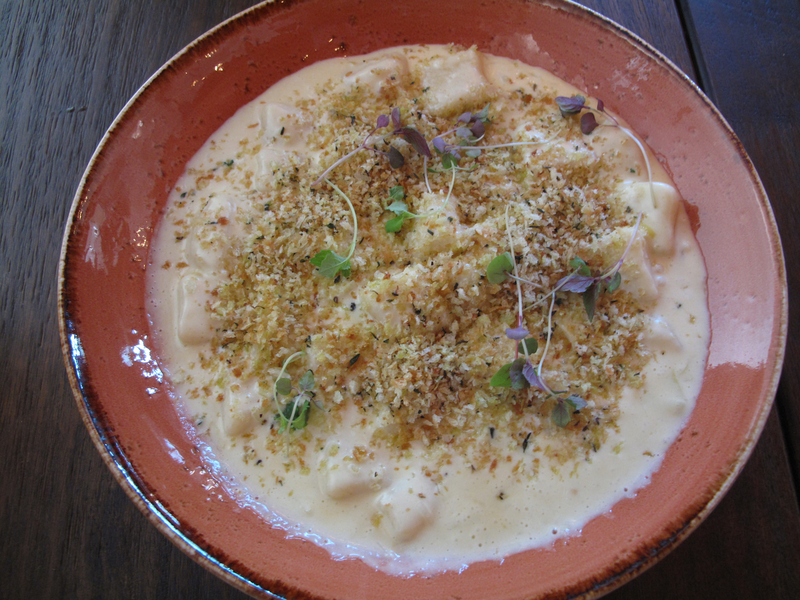 Julian loves his three cheese gnocchi ($24) with gorgonzola, grana padano and vintage cheddar. It, too, is a big serve – Bennie and I get a good sample, so fully understand his enthusiasm. The pasta pillows really are like the proverbial clouds and very wonderful. Based on his regular experience with this dish at another establishment, Julian wistfully mentions that he would’ve liked to experience some actual bits of cheese in the otherwise entirely smooth sauce. But even he admits that’s a case of being very, very picky. I am trying to wean Bennie off chicken burgers – both for his own good and for purposes of CTS diversity. 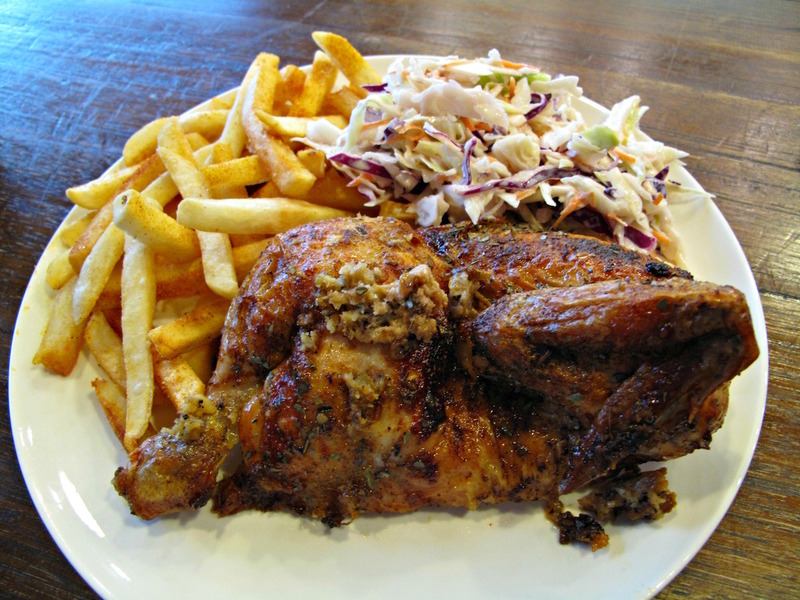 But he enjoys the Melba Social rendition ($18), noting with thumbs-up approval that he considers his twin chook chunks to be “expertly fried”. The shoestring chips are $6 extra, just OK and place the package up there into the restaurant burger combo category. Our minor quibbles about our meal thus far are put behind us as we gleefully devour both desserts on the menu. And that’s all that needs to be said. 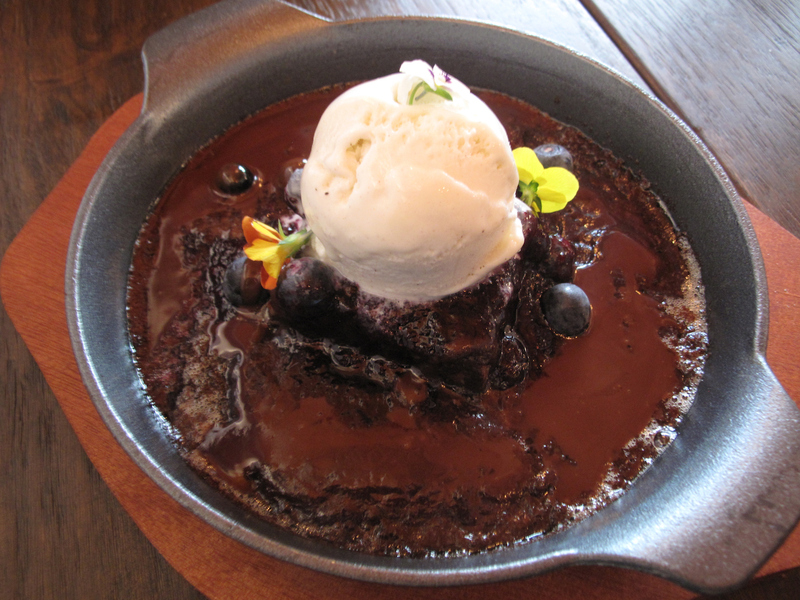 A good deal richer and more decadent is “sizzling” brownie ($15). The brownie square is bigger than it appears and swims in a sticky sauce studded with blueberries. 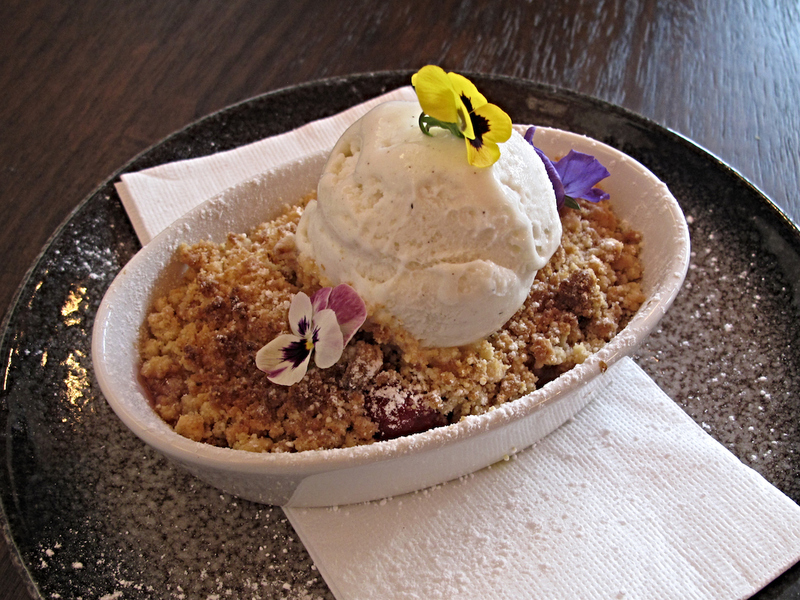 The vanilla bean ice-cream that accompanies both desserts is excellent. 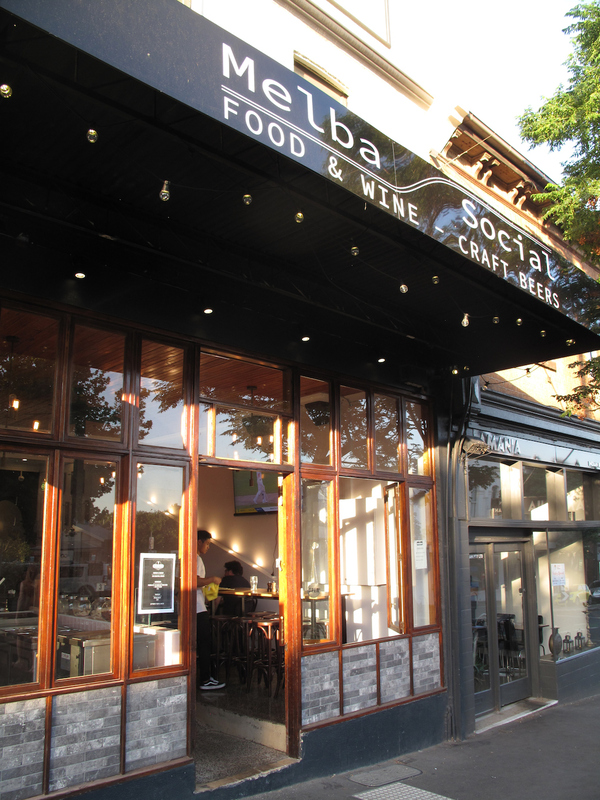 Melba Social strikes us the sort of place that will become a cherished “local”. One of these days, we’ll take Kensington Food Hall and its regular menu for a spin. We were actually very close to doing so a few months back, but we were waylaid by a very different – and fine experience – at food truck just up Macaulay Road. And we like the look of the vegan feasts KFH is running. But tonight we’re here for the $10 Monday paella special. Kensington Food Hall (520 Macaulay Road, Kensington. Phone:9078 5248) has taken over the premises formerly inhabited by Korean joint Frying Colours. 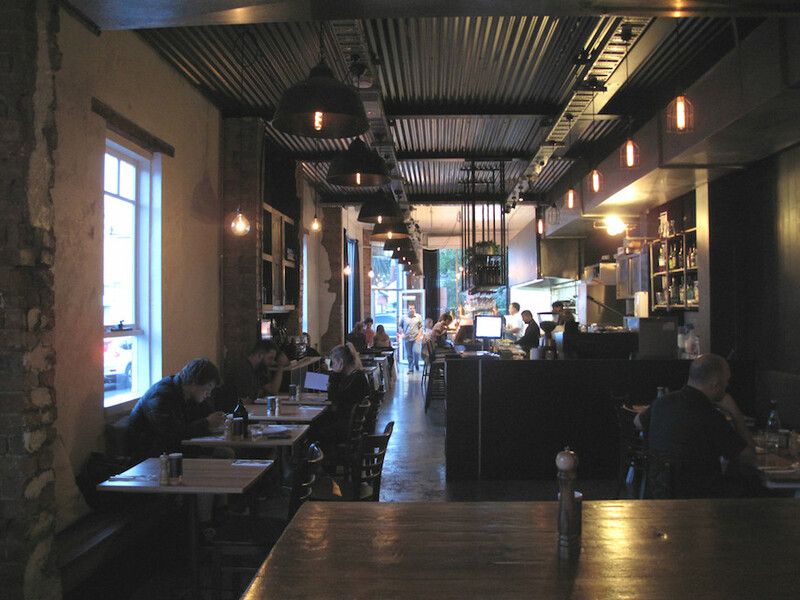 It’s been so long since we were in that eating house, that we can’t surmise about how different the new fit-out is. It is, however, very gloomy (we arrange our own mobile lighting) – though it’s also a cheerful place, with the wall-to-wall ’70s/’80s hits struggling to penetrate the happy hubbub. Now, when it comes to variations on the universal rice dish, we have our prejudices. Well, in the past that way has provided us with mostly disappointment. So we are keeping our expectations well in check. Happily, wonderfully, that turns out to be entirely unnecessary. 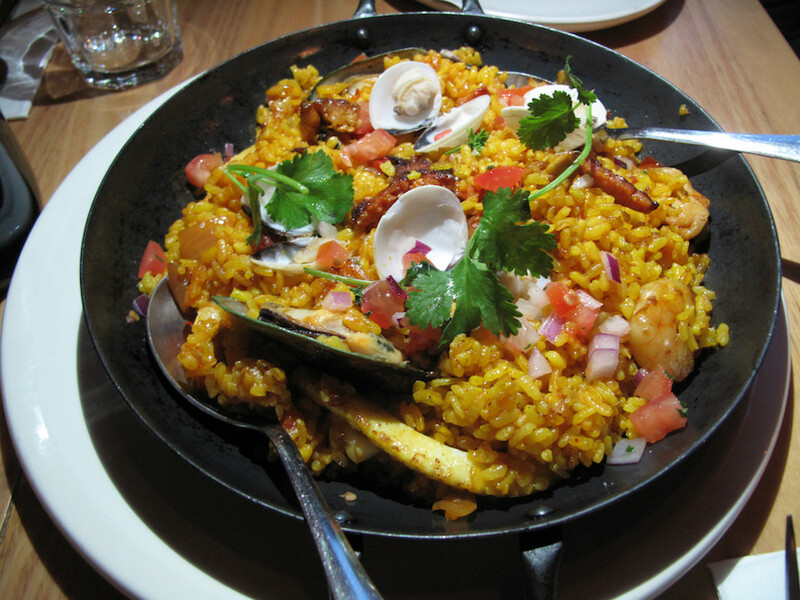 The Kensington Food Hall paella is a smashing winner. Our serve-for-two is mildly, deftly seasoned with – I surmise – just the right hint of saffron. It is brimming with seafood – shellfish and calamari – along with chicken and smoked sausage. Wow – what a score for $10! 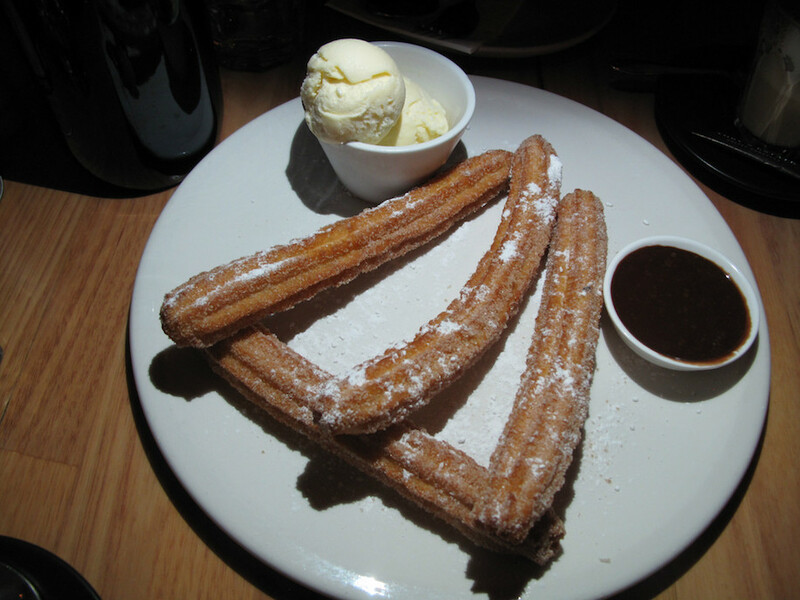 We are having such a fine time, we hesitate not about ordering churros ($12). Served with two scoops of vanilla ice-cream and choc sauce, they are fresh, fat and fabulous. We arrived soon after the start time of 5.30pm; when we leave about an hour later, the joint is rocking and very busy – the Monday night paella project is an obvious success. So we suggest arriving early, as we did, or late. We are eating from yucky polystyrene – and it’s all our fault. 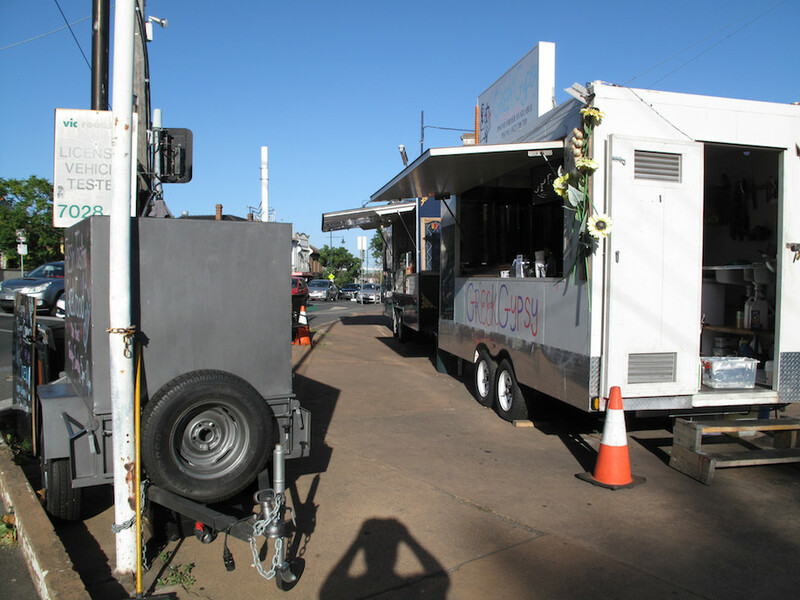 If we’d made clear our eating intentions – to have our dinner right there, beside the food truck that is Greek Gypsy – we’d have been provided proper crockery. As it is, we do get metal cutlery as we proceed to enjoy our meals. And very good they are, too. The outdoor furniture that accompanies the Greek Gypsy routine may not be any less disposable than the polystyrene containers. 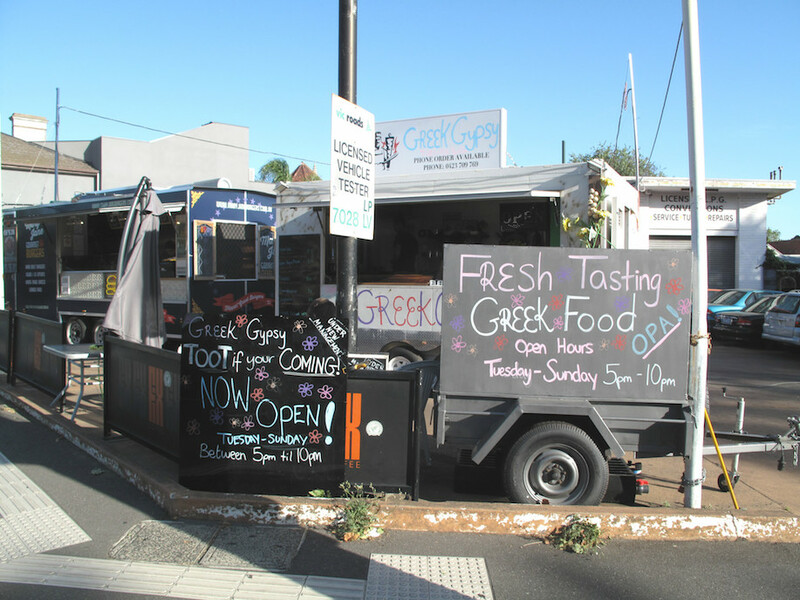 But the food is every bit as delicious and enjoyable as that to be had at the other Greek enterprises that have been unveiled in our greater neighbourhood in recent months – see here, here and here. 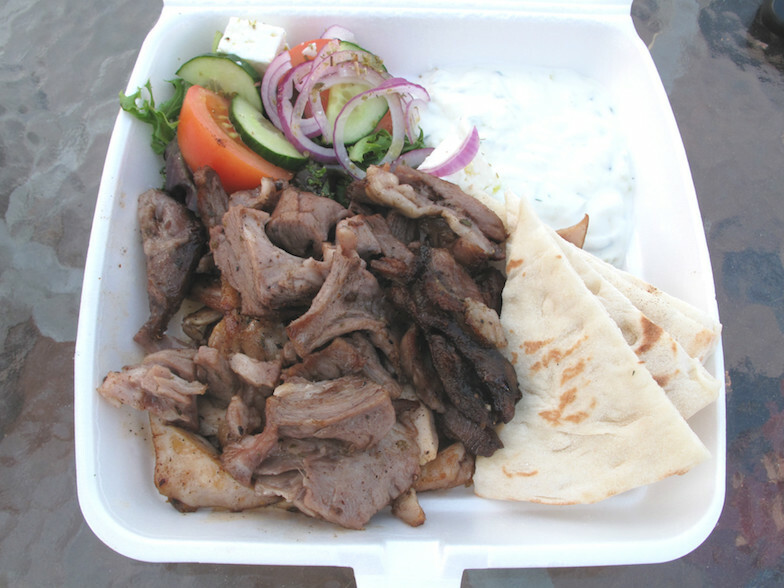 … open gyro plates ($14), with a mix of lamb and chicken. 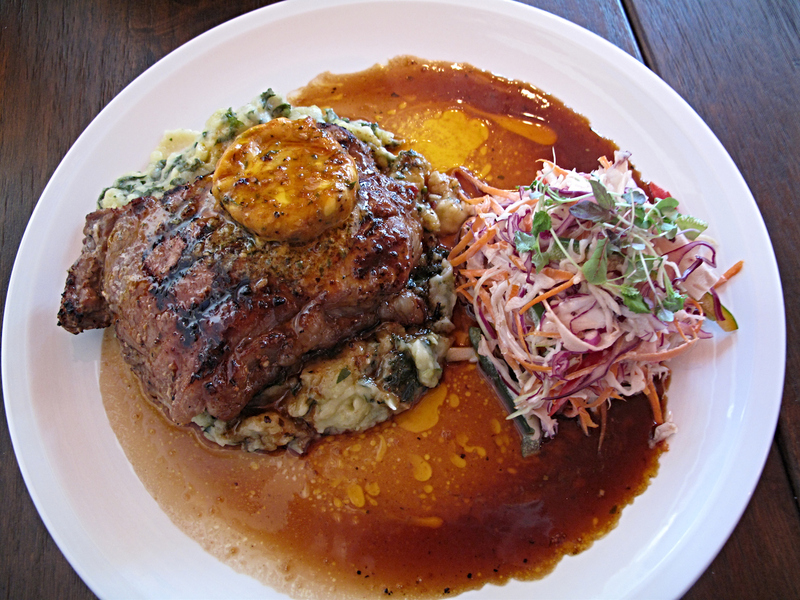 The meat is outstanding – both juicy and chewy, the lamb having a slight edge IMO. Toasted pita goes good with a generous serve of excellent tsatziki. Chips ($5) are just the teensiest bit too oily. But otherwise, they are hot, crisp and yummy – and, like, the meat, way better than we have been expecting from this food truck operation. One of the dinner options we had been contemplating this night, just down the road apiece, would’ve run to a minimum of $80 for the pair of us – and quite probably more than $100. Yet here we are, sitting atop Kensington Hill, having spent a fraction of that and grinning like happy fools as we eat like kings and watch the traffic and the world flow by. We’re in Mr Griffiths for the poutine – a dish we’ve never before eaten. 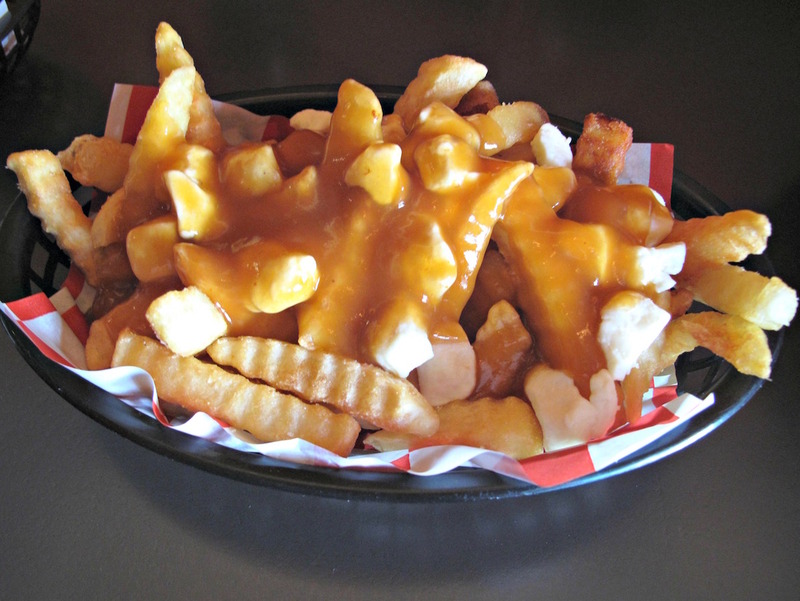 But we’ve had plenty of loaded fries – and so far as I can tell, the Quebec-derived poutine could be the very first loaded fries. We order the regular poutine – called The Drummondville (small $7). I am perplexed and underwhelmed – the gravy and the curd lumps seem to add nothing to the fries. And the fries themselves seem lacklustre. Bennie loves them – cleaning the basket empty after I’ve grabbed a handful of fries untainted by the toppings. That figures – his eyes invariably light up when he sees the phrase “loaded fries” on a menu. Mine tend to glaze over. 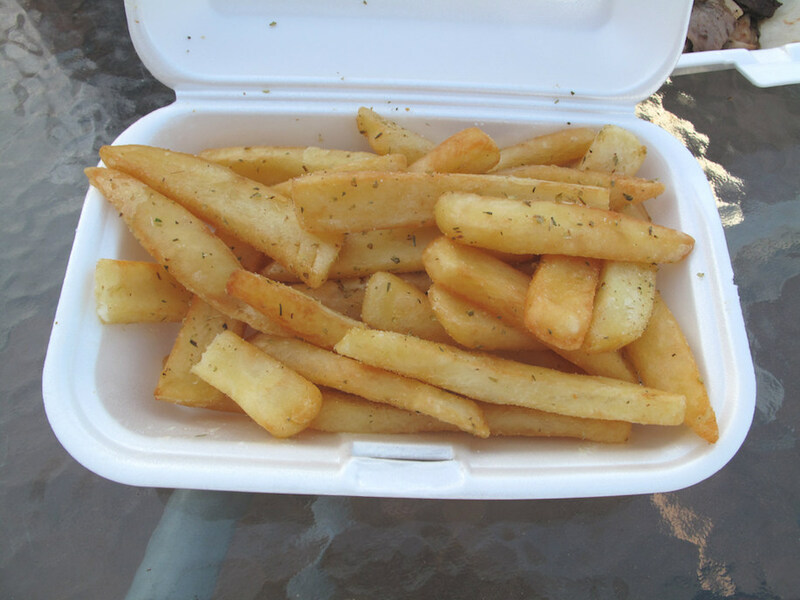 My argument is simple: Why ruin fries – especially ones as good as those we inhaled recently at Littlefoot – with toppings that make them soggy? So in fairness to Mr Griffiths, I’d say that even a serve a poutine fan deems of the very highest order would do nothing for me. Mr Griffiths is a newish and welcome addition to Macaulay Road. It’s a cool room, already with a relaxed neighbourhood vibe about it. Beer is big here and the place is done out in Melbourne black. It appears to be a hit – a previous mid-week attempt to try the food came to nothing as the place was packed when we tried. If poutine is your thing, there are variations to be had that include the likes of fried chicken, hot sauce, pickles, onion, bacon, maple syrup and more. It stands to reason poutine (not offered by many places in Melbourne) is a stronger selling point here than the burgers (sold by every man and his dog). But as it turns out, our burgers are the highlight of our Saturday lunch – a judgment with which even my poutine-loving son agrees. 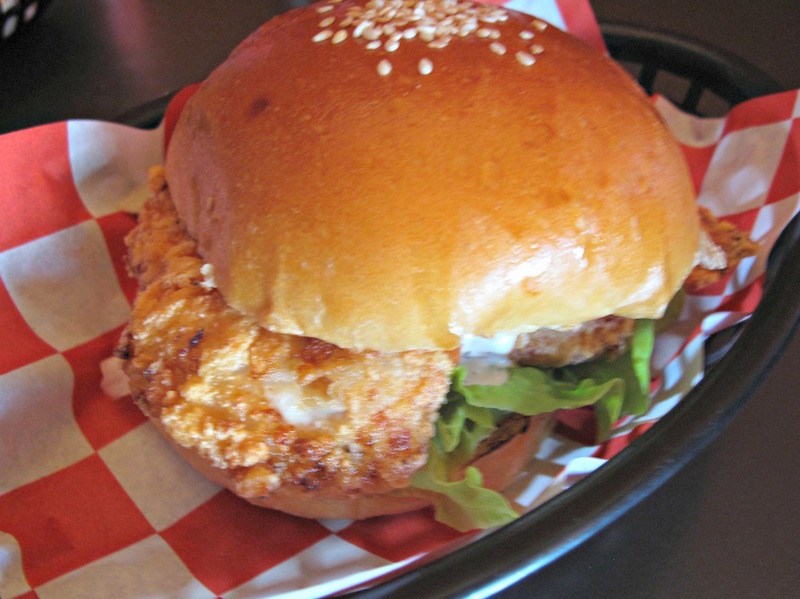 He loves the crisp ‘n’ crunch of the beautifully cooked chook in his Buffalo chicken burger ($12.50) with its Frank’s red hot, lettuce and ranch sauce. My Bacon G’s burger deluxe ($12.50) is equally impressive with its beef, bacon, tomato, lettuce, pickles, onion and G sauce. And unadvertised cheese. Big statement: This is the best bacon I can recall ever enjoying in a burger. Get this – it’s both chewy and crunchy, it’s thick-cut and its flavour imbues almost every mouthful. This is something of a rarity, something that should be wildly celebrated. 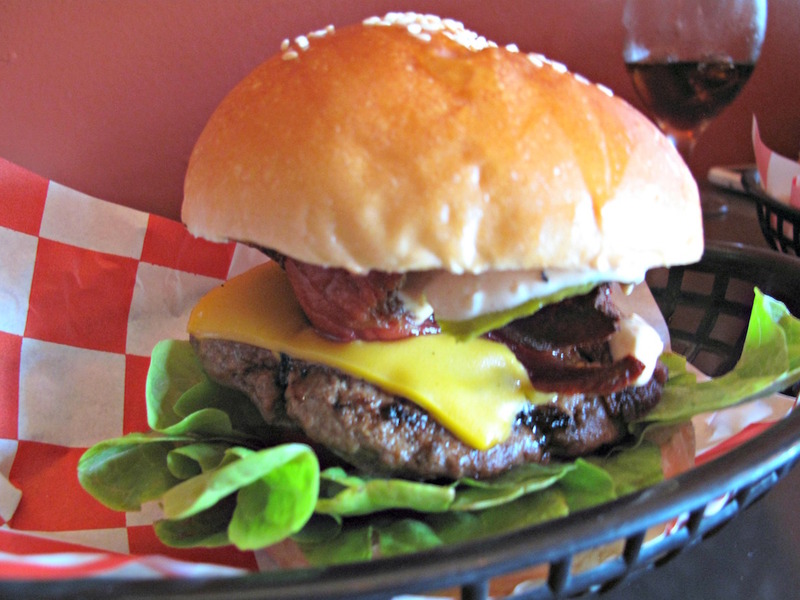 As Bennie points out, there is nothing extravagant or sophisticated about our burgers. Indeed, at first blush they appeared to be on the plain and modest side. 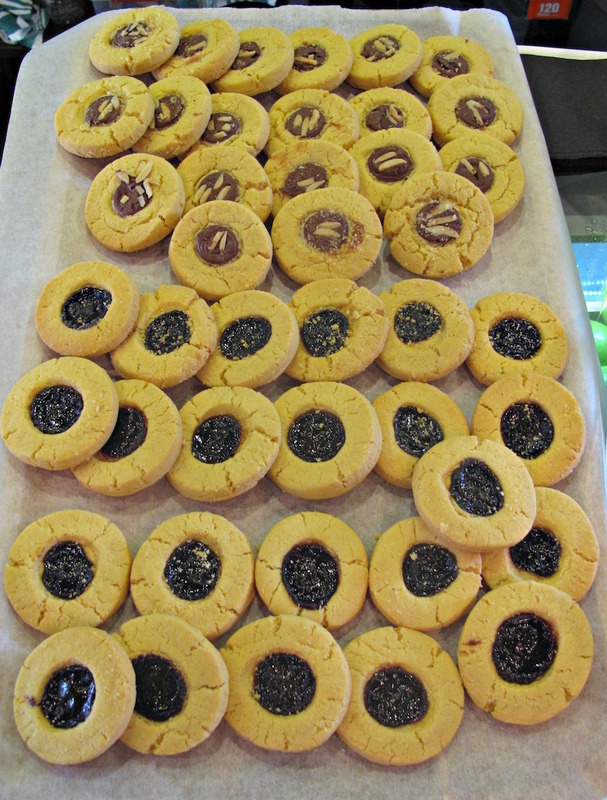 But the truth is in the eating – they win because good ingredients have been done well. Check out the Mr Griffiths website here. 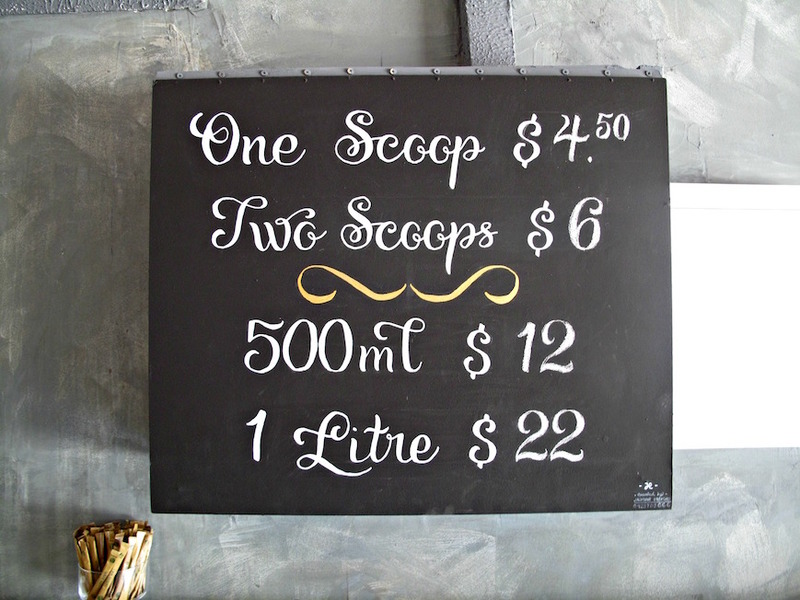 Since first writing about the gelati emporium that is 1565, we’ve dropped in for the odd and very excellent cone or cup. 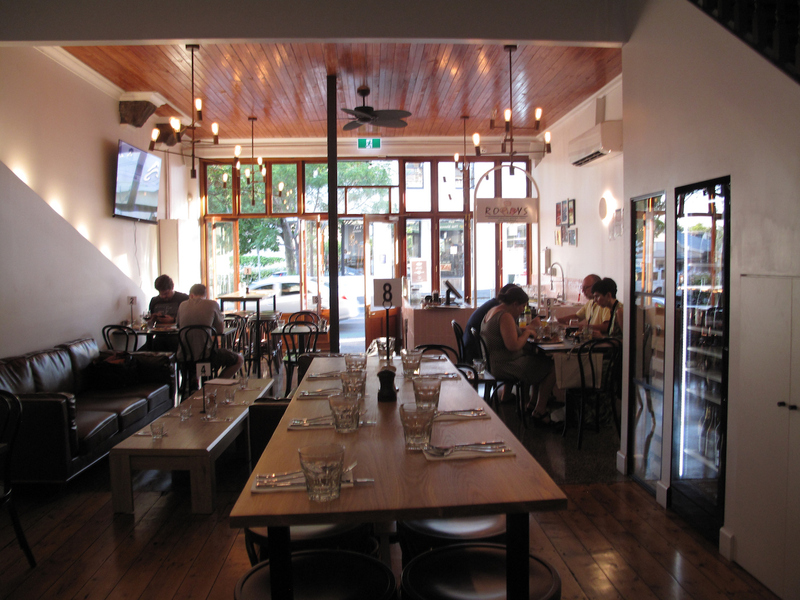 On a recent visit, we discovered that Kensington joint is doing lunches, too, so I am happy to check it out. 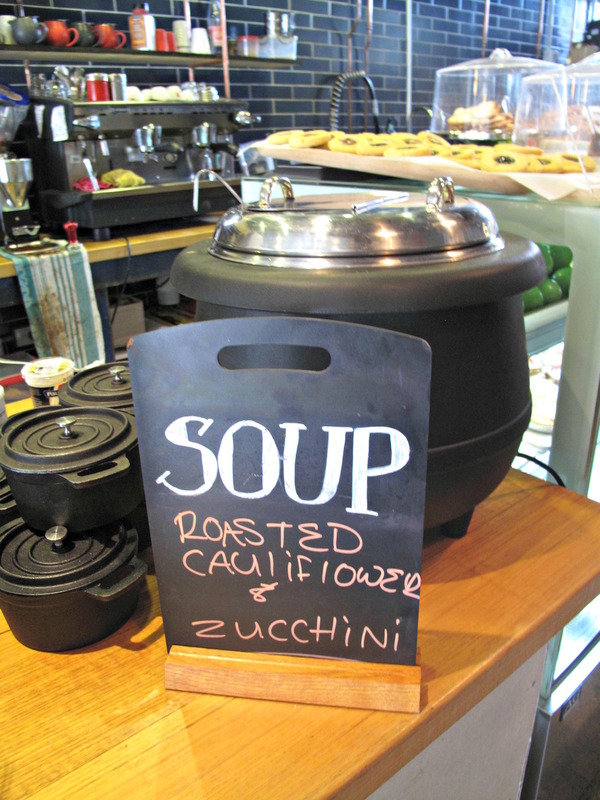 Soup ($10) with a crusty bread roll. There’s arancini for $5 ($9.50 with salad). 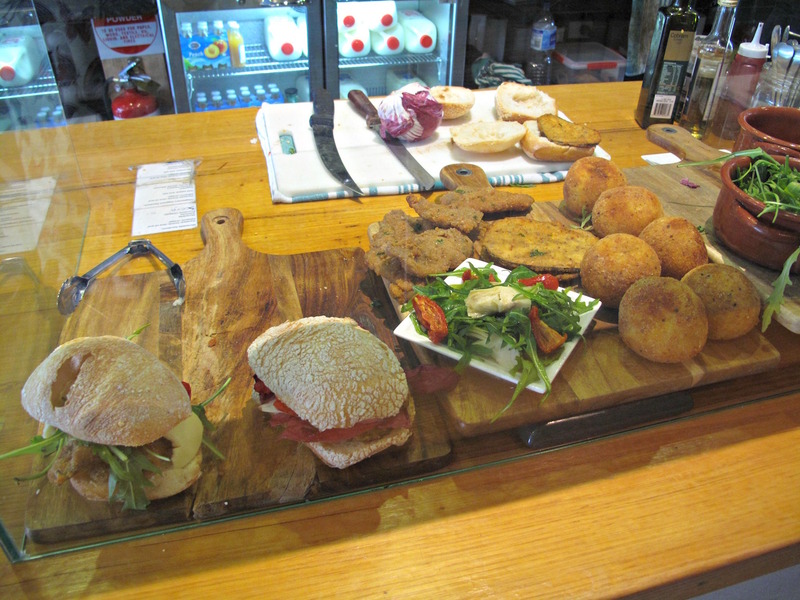 And those same superb rolls are used in panini ($9.50) – your choice of schnitzel, eggplant or beef. 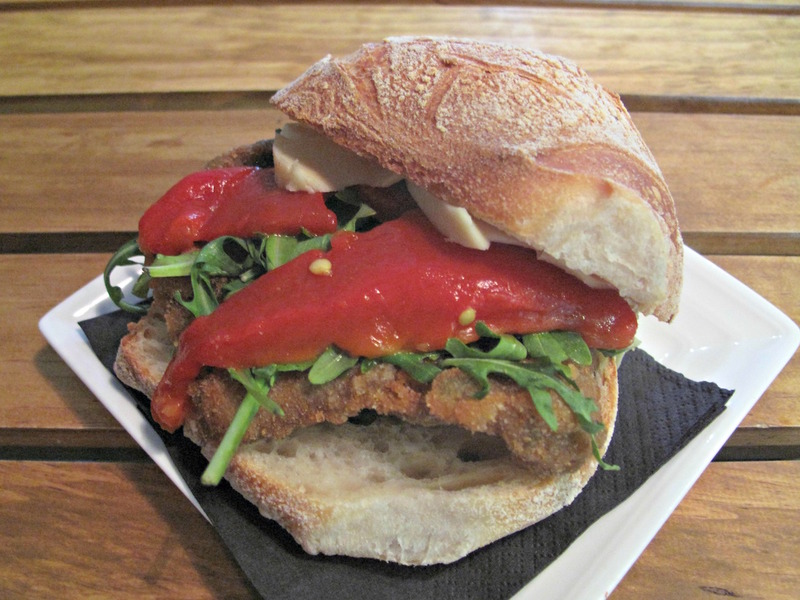 My beef schnitzel job is medium rather than large, but there’s no doubting the good, fresh flavours and prime eatability of the meat, bread, rocket, roasted capsicum and scamorza cheese. 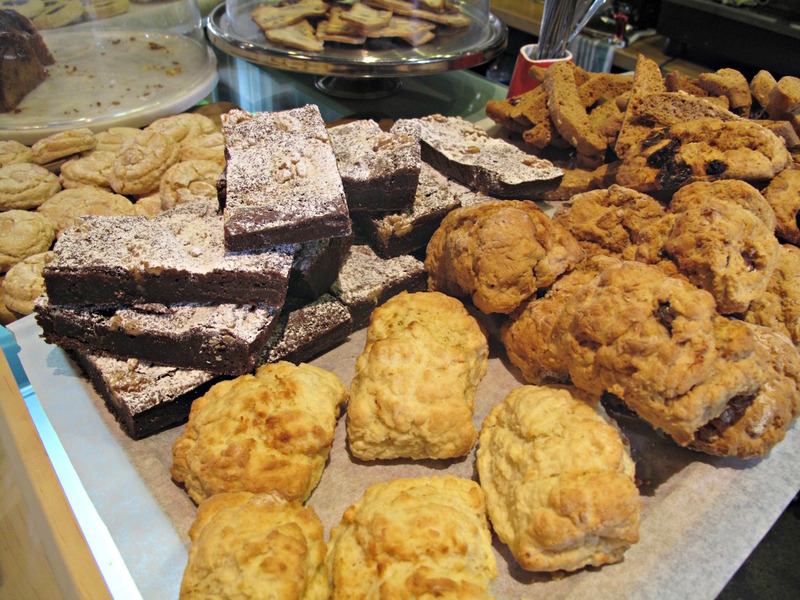 As well, there is a small but wonderful range of biscotti and cakes, all made on the premises. Tootling to Kensington to do a story on Kensington’s new gelati joint for The Age – see story here – I am envisaging little more than the profound pleasures of trying some excellent Italian ice-cold creaminess, meeting the people involved, writing about both and then maybe creating a subsequent post for CTS. 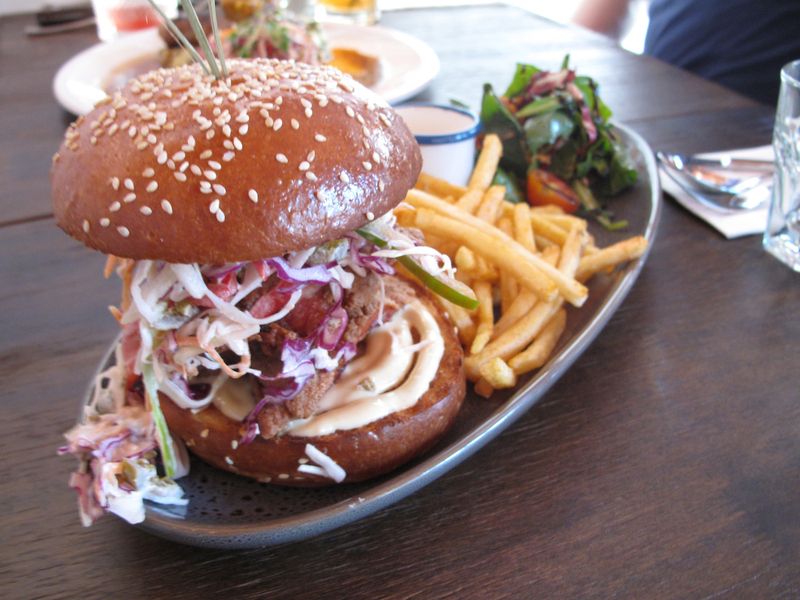 An enjoyable, satisfying day’s work, in other words, for a western suburbs food blogger. I get all that in spades – and more. 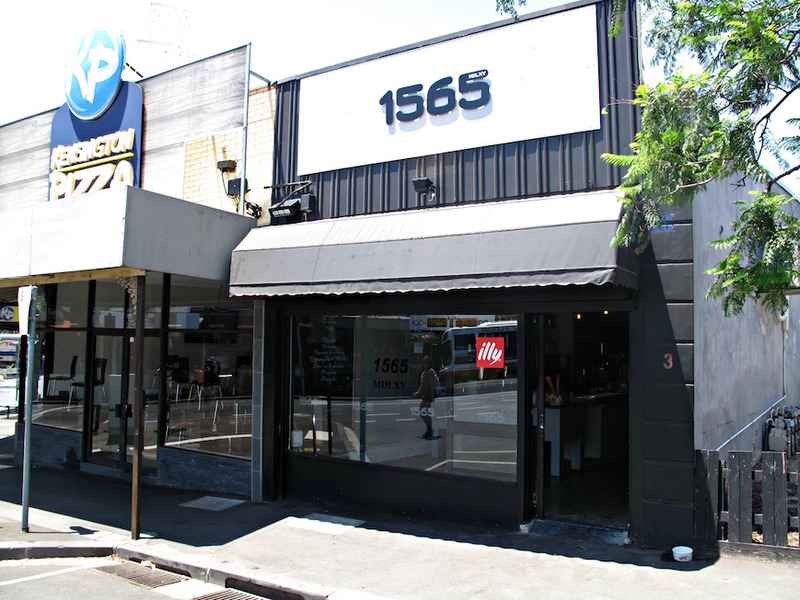 For what I discover is that the crew behind 1565 – brothers Adriano, Alfred and Alessio Acquaro and their mum, Joy – have strong family ties to Pizza d’Asporto and Kiosk by d’Asporto in Williamstown and Impasto Forno Antico in Avondale Heights. Indeed, the canoli and the like that abet the 1565 gelati and coffee here are supplied by the latter establishment. How wonderful to discover yet more of the connections and depth of food culture traditions that weave and wander across the west in all sorts of ways! 1565, just off the commercial strip of Macaulay Road, is done in simple, elegant style. 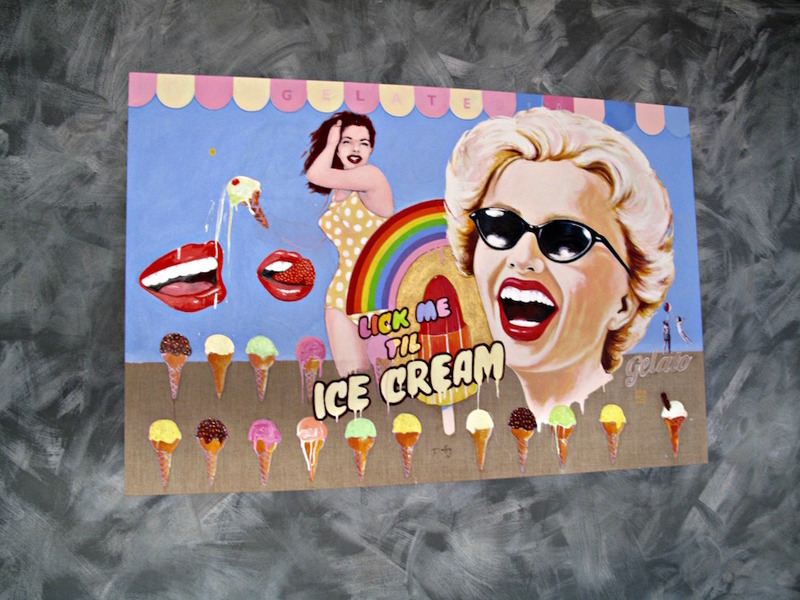 It is named after year gelati was apparently “invented” in Florence. 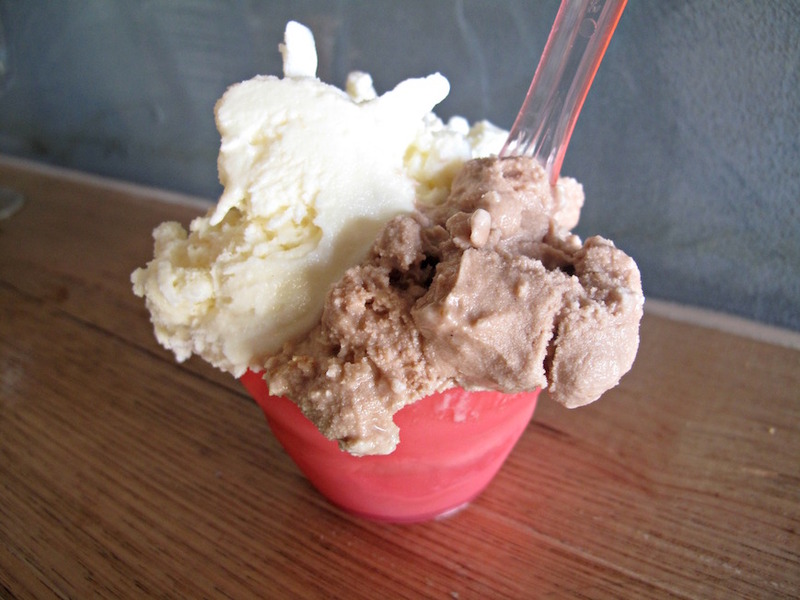 If, on that basis, you’d expect an approach to gelati that is strong on tradition, you’d be spot on. But while staying within those parameters, the 1565 crew are doing marvellous things in terms of flavour diversity. Sure, there’s vanilla, pistachio and coffee. But there’s also booze in the form of rum and raisin, Prosecco and the sweet liqueur of No.43. Then there’s poached fig, watermelon and mint, panettone. I enjoy a wonderful scoop apiece of ricotta and miele (honey) and Nutella with rum baba. Like orange and fennel, that latter of my two is imbued with textures beyond creamy. Bennie is equally delighted with his double-banger cone of poached fig and coffee. 1565 is open from noon until late seven days a week. For all of our 15 years in the west, five of them as food bloggers, we have frequently observed that the Macaulay Road strip looks like it should be a food and drink star. But it’s never been that. Under-achiever is a phrase that comes to mind. Perhaps the arrival of 1565, joining the cool Korean of Frying Colours up the road and with a new Italian place soon to be unveiled, heralds an upturn in Macaulay Road’s eats situation.